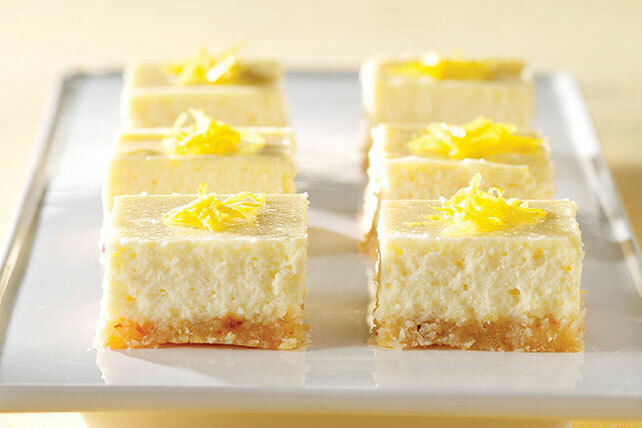 Bite into one of our PHILADELPHIA 3-Step Lemon Cheesecake Bars for a sweet, citrusy treat! Prep for these lemon cheesecake bars only takes 10 minutes. Combine cookie crumbs and margarine; press onto bottom of 8-inch square pan sprayed with cooking spray. Beat cream cheese, sugar, lemon zest, juice and vanilla in large bowl with mixer until blended. Add eggs, 1 at a time, mixing on low speed after each just until blended. Pour over crust. Bake 20 to 25 min. or until center is almost set. Cool completely. Refrigerate 3 hours. Enjoy a serving of these cheesecake bars on a special occasion. For a quick garnish, sprinkle with additional lemon zest just before serving.